This chunky pencil functions as a colored pencil, watercolor, and wax crayon all in one — perfect for a variety of techniques, and for those with endless imagination. The extra-thick, 10 mm lead is as thick as eight standard colored pencils. It resists breakage and provides soft, rich strokes that exhibit high luminosity, high opacity, and high color intensity, even on dark papers. The Woody 3 in 1's outstanding watercolor properties make it ideal to paint with, too. It also writes on smooth surfaces such as glass, metal, leather, and more. Choose the Woody 3 in 1 for large surfaces — and for small hands! Set of 6 — This set contains one each of Dark Green, Ultramarine, Yellow, Red, Lilac, and Burnt Red Umber. A sharpener is also included. Set of 10 — This set contains one each of Red, Indian Yellow Deep, Yellow, Light Green, Dark Green, Cyan Blue, Ultramarine Blue, Lilac, Black, and Burnt Red Umber. A sharpener is also included. 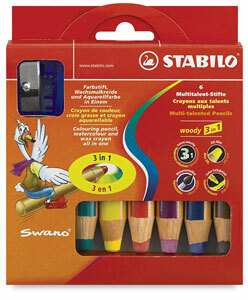 ® Stabilo is a registered trademark.